Hryb is the Emmy-winning director of programming at Xbox Live and was in Melbourne for the annual Penny Arcade Expo (PAX). Hryb spoke to a packed stadium when he gave the opening Storytime keynote about his passion for gaming, offering insights into subjects from cracking the industry to the Xbox Live Onesie giveaway. We had the chance to sit down with Hryb for a quick chat on gaming trends and how he got a Bacon number of 1 in Six degrees of Kevin Bacon. 1) What’s next for gaming? Are we looking at more VR and more immersive gaming experience? 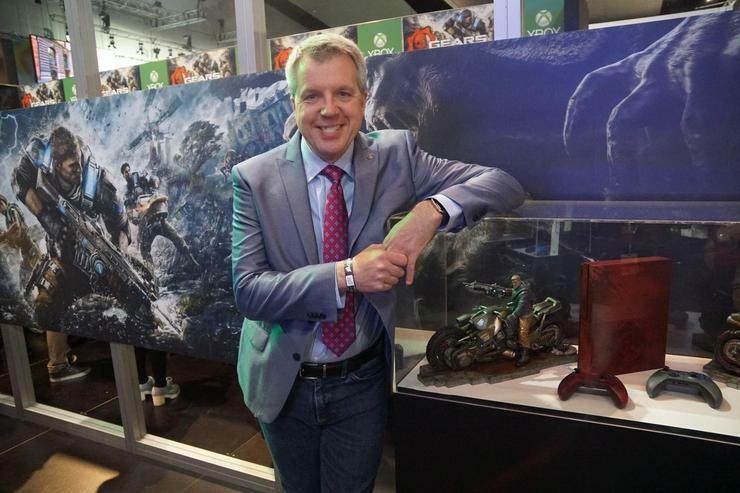 LH: Phil Spencer has talked about this a little bit and we are going to do what feels right and makes sense. With virtual reality there is a lot of excitement right now but we haven’t seen a real killer app. We have a mixed reality/augmented reality solution of HoloLens which we are doing a lot of work on, but right now we haven’t found that one thing. But if that’s where the market takes us, that’s where we will go. 2) Let’s talk a little bit about your career. You’ve started in radio, and then transitioned to MSN music then to Xbox. How did that come about? LH: I don’t realise it at that time but when you look back you realise what important moments of inflection they are. You are kind of like a katamari ball you learn so much and it all comes together and I realise that I was doing at that time was leading me up to what I’m doing now and preparing for this career. 3) What would you say have been your biggest achievements in your career with Xbox? LH: Biggest achievement is really being able to work on a team and create a world for myself that represents the thousands of men and women working at Xbox and to be a part of that team. I embody what is success and achievement in terms of that I am so lucky to be part of this. Every day I wake up and know I’m one of the luckiest guys to work in the gaming industry. 4) And the most exciting thing since joining Xbox? LH: Probably every time we launch a console. When we launched Xbox 360 it was a special time for us and I remember that like it was yesterday. And we launched Xbox One and it was special. So every time we launch something new, it is very exciting. 5) Your website majornelson.com has amazing content, what was the motivation behind creating the website? LH: The main motivation was back in 2004, before blogs really started taking off I wanted to create a place where people could go to find out what gamers wanted to know like “what are the new releases?” and where they can get accurate, reliable and timely information and that’s what it is. And that’s why it’s turned into this utility for Xbox gamers and not really have to think about it because everything is displayed in a very clear and concise format. 6) What are your thoughts on social media and has that played a pivotal role for you to engage with the gaming community? LH: One thing I have always tried to do is use those tools to connect with gamers wherever they are. Whether the new thing is Instagram or Snapchat I like to find the right medium for the message and what feels right and I have settled for twitter and I have over a million followers now. A lot of gamers are on twitter and they like to communicate with that. 7) What’s an average day at the Xbox office look like? LH: Every day is different and that’s what I love about my job. A lot of time right now is spent talking to our product teams and helping them with product plans and implementing them. It’s hard to believe because we are only in November and I’m already having plans for E3 next year in June. So it’s a lot of planning and a lot of looking at what the community wants. No one day is the same. 8) How did the Bacon number of 1 in Six Degrees of Kevin Bacon come about?